Welcome to your specialist for mobile applications! apps on air is the specialist for distributed systems and mobile communication. 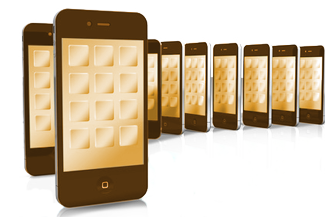 Our main focus is the development of applications for mobile devices. Current mobile phones, in particular smart phones, are portable computers comparable to the last generation of high performance computers. These phones are equipped with a vast array of communication interfaces and built in sensors. Previously, mobile phones were limited to voice communication and text messaging, but modern technology enables completely new uses for mobile phones. For example, GPS receivers turn phones into navigation systems and phone cameras can be used as barcode scanners to compare products and prices via the Internet. The conceivable uses of mobile phones are limitless. apps on air takes up the challenge to research and develop new applications for mobile devices. Our team has the unique combination of multimedia design and eMarketing experience and the technical skill necessary to provide your company quality service. Our company is located in Frankfurt, Germany.